Thus far in my writing about my Katzenstein relatives, I have written about the descendants of my great-great-grandfather Gerson Katzenstein and those of his half-sister, Hannchen who married Marum Mansbach. Now I turn to the descendants of another of his siblings. 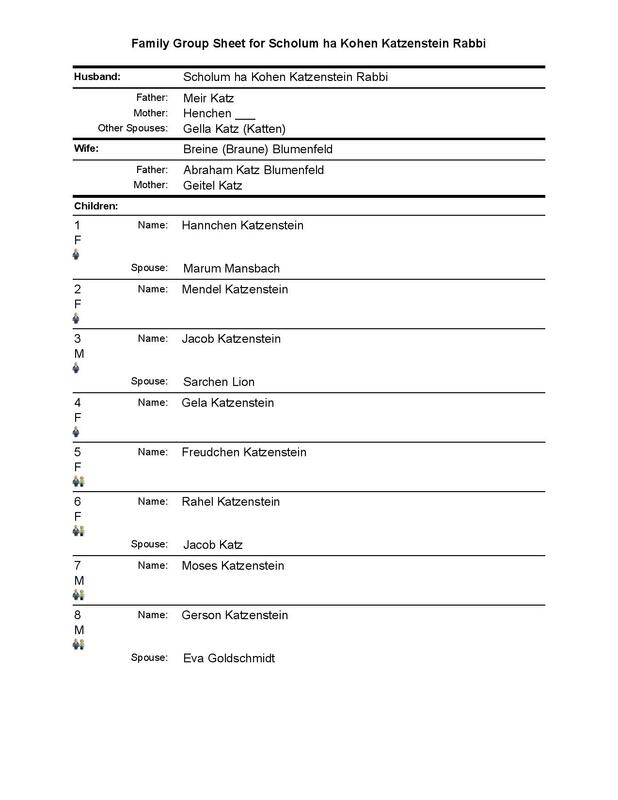 As I wrote earlier, according to the research done by Barbara Greve, my great-great-grandfather Gerson Katzenstein had three full siblings, the children of my 3x-great-grandparents Scholum Katzenstein and Breine Blumenfeld, and four half-siblings, the children of Scholum and his first wife, Gelle Katz or Katten. Gerson’s three full siblings were Freudchen, who died as a child, Moses, for whom there does not appear to be further information after his birth, and Rahel, the only other full sibling for whom there is adult information. 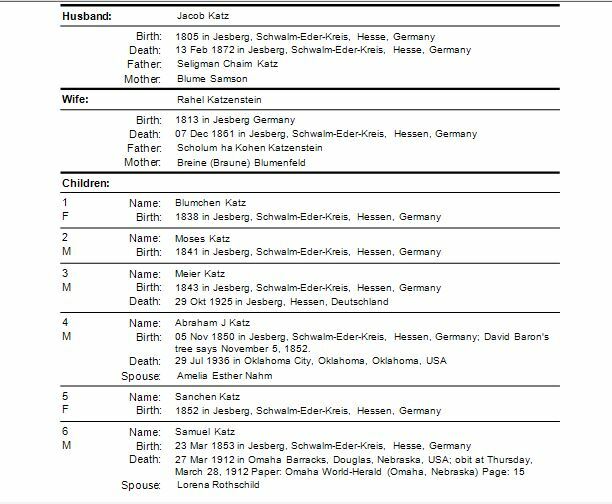 The next several posts will focus on the descendants of Rahel Katzenstein, my 3x-great-aunt. Rahel, was born on January 15, 1813, in Jesberg. She married Jacob Katz, also of Jesberg; he and Rahel may have been cousins, as I wrote about here. Rahel and Jacob had six children: Blumchen (1838), Moses (1840), Meier (1843), Abraham (1850), Sanchen (1852), and Samuel (1853). I know for certain that two of those children, Abraham (or Abram) and Samuel, immigrated to the United States; as for the others, I am still researching, but at least Meier had several descendants who came to the US as well, some not until much later. But for now, I will tell the stories of Abraham and Samuel. Their mother Rahel died on December 7, 1861, in Jesberg, when Abra(ha)m was eleven and Samuel was eight. 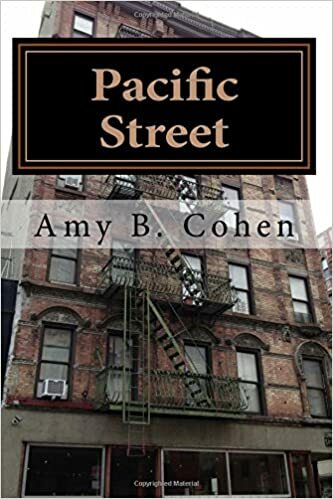 Their father died a little over ten years later on February 13, 1872, in Jesberg. By that time Abra(ha)m had already left Germany, arriving in the US in 1868 when he was only eighteen. 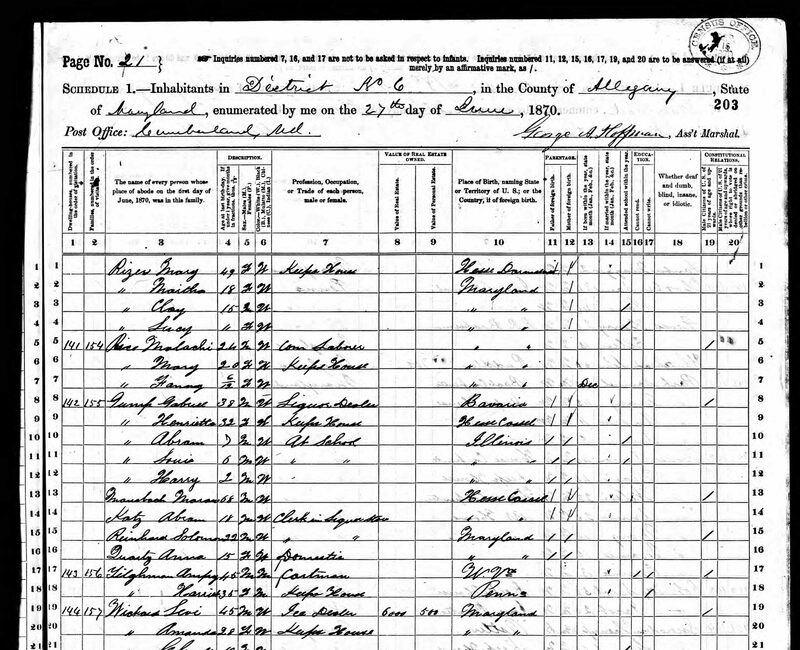 He appears on the 1870 census living in Cumberland, Maryland, with the family of Gabriel Gump, who was married to Henrietta Mansbach, Abra(ha)m’s half-first cousin and daughter of Hannchen Katzenstein. Gabriel Gump owned a liquor store, and Abra(ha)m was working as a clerk in a liquor store, presumably that of Gabriel Gump, his cousin’s husband. Abra(ha)m’s younger brother Samuel left Germany in August, 1872, six months after his father’s death. 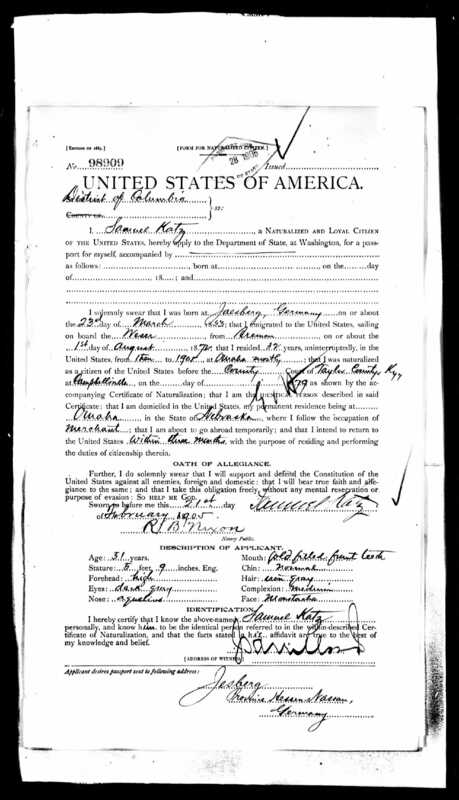 I believe that he is listed as Samson Katz on this ship manifest, as his passport application indicated that he had arrived on the Weser from Bremen in August, 1872, and this is the manifest for that ship arriving in New York on August 31, 1872. Sam would have been nineteen years old on that date, as is the Samson Katz on the manifest. By 1880, Samuel had married Lorena Rothschild, and they were living in Campbellsville, Kentucky, where Samuel was a dry goods merchant. According to the 1900 census, Samuel and Lorena had married in 1880, so they must have been newly married on the 1880 census. Lorena was born in Kentucky in about 1861 and was eighteen years old when she married Samuel. Her parents were born in Bavaria, and her father was a butcher on the 1870 census. Abra(ha)m had also moved to Kentucky by then. On the 1880 census he was living in Horse Cave, Kentucky, was single, and was working as a dry goods merchant. Horse Cave is less than forty miles from Campbellsville, and both are about 80 miles south of Louisville. In 1880, the population of Horse Cave was 526 people; the population of Campbellsville was 775. Both towns had experienced substantial growth between 1870 and 1880. They must have been good locations for a merchant to set up a dry goods store. Although I can find no evidence of an established Jewish community in either town, Louisville did have a well-established Jewish community by the 1880s and was not terribly distant from either Campbellsville or Horse Cave. By 1882, Abraham had married Amelia Esther Nahm. She was born in Louisville on January 16, 1860; her father, Joseph Nahm, was, like his son-in-law, a dry goods merchant and had emigrated from Germany. Her mother, Sarah Montag, was also born in Germany. During the 1880s and 1890s, Abraham and Amelia were busy having children; their first child, Rachael, was born in Horse Cave on April 25, 1882. A year later on July 20, 1883, Blanche was born, followed by Lester on March 17, 1885, Sidney on August 27, 1886, Florence on June 26, 1888, Bertha in August, 1890, Benjamin on August 22, 1892, Henrietta on October 15, 1894, Sigmund on August 5, 1896, and finally Milton on November 18, 1901. That makes ten children in nineteen years. Wow. Although the first eight children were born in Horse Cave, by the time Sigmund was born in 1896, the family must have relocated from Horse Cave to Louisville as Sigmund was born there. 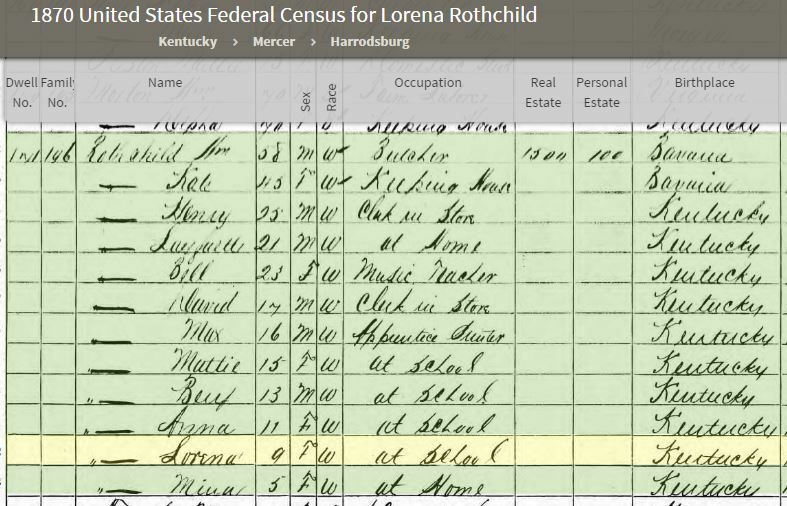 (I am not sure where Henrietta was born more specifically than Kentucky.) According to the 1900 census, Abraham continued to work as a merchant in Louisville. Meanwhile, Samuel Katz and his wife Lorena had a son Jay on October 23, 1882. It is not clear where Jay was born because the records are in conflict. Every census report from 1900 through 1920 reports that Jay was born in Kentucky. And my study of the Omaha directories seems to suggest Samuel Katz did not arrive in Omaha until after Jay was born as Samuel is first listed in the directories in 1885 and is not listed in the Nebraska State census of 1885. But the Illinois Death Index says he was born in Omaha, not Kentucky. Further research suggests that the Illinois Death Index is incorrect and that Jay was in fact born in Kentucky. Since Jay filled out his draft registration card himself and since I’ve seen so many errors on census records, I was inclined to think that Jay was born in Omaha. What do you think? Which source(s) would you trust? Perhaps Jay, who lived his whole life in Omaha, mistakenly assumed he was born there or wished he had been? At any rate by June 6, 1885, when the Nebraska State Census was taken, Samuel was living in Omaha, Nebraska. What had taken him there? And what he doing there? Only two of the half-siblings survived to adulthood. One was Hannchen, who married Marum Mansbach, whose family I’ve already written about extensively. The other was Jacob, who was born in Jesberg in 1803, married Sarchen Lion, and had eight children, whom I have yet to research. I wrote about the family of Gabriel Grump in earlier posts. See here, here, and here. This entry was posted in Genealogy, Germany, Jesberg, Katzenstein, Kentucky, Nebraska, Omaha and tagged genealogy, Katz, katzenstein, Kentucky by Amy. Bookmark the permalink. Good questions about Jay’s birth location. I usually lean toward the self-reported records but in this case his self-reported birth place doesn’t seem possible. Interesting quandary. I would look for more records. Good luck! I did find one more secondary source—I will write about in a later post! It seems like the self-reported birth place would make the most sense but it is perplexing as to why it is different. I’ll be anxious to see if you are able to solve that mystery. I know! Can you imagine getting pregnant every two years? And each time obviously having a 15 month old to care for (plus all those older siblings)? I do think the older siblings did a lot of child care, but still!! I hope I can find a real answer to where Jay was born. So far though, I’ve found nothing authoritative. Every 18 months to 2 1/2 years was a pattern on my Mom’s side of the family, too. Amberly makes a good point about self-reported being possibly more reliable. With the 1890 being missing and the family moved from KY to NE it’s a hard call to make. These are the ones I end up listed as Kentucky or Nebraska. Ten children for one and only one for the other family. Such a big difference. If only Jay was from the larger family it would be a lot easier!